Called the Red Bridge locally, this medium-span truss carries a gravel-surfaced county road across the South Skunk River south of Reasoner in Fairview Township. Jasper County records indicate that the bridge was constructed at this location in 1892. Local bridge contractor H.S. Efnor held the county's annual bridge construction contract for that year, and he erected this bridge by September 1892 for $3,515.34. The bridge functioned as built until it was extensively damaged by flooding in 1947. The county then replaced one of the structure's original steel cylinder piers with concrete and added a pony truss approach span. The Red Bridge has functioned since in essentially unaltered condition. The Pratt and Warren truss configurations were both developed in the 1840s, but it was the Pratt that received the most widespread use in the late 19th century. The reasons for this probably relate to the versatility of the pin-connected Pratt for different span lengths and its easier erection using timer falseworks. 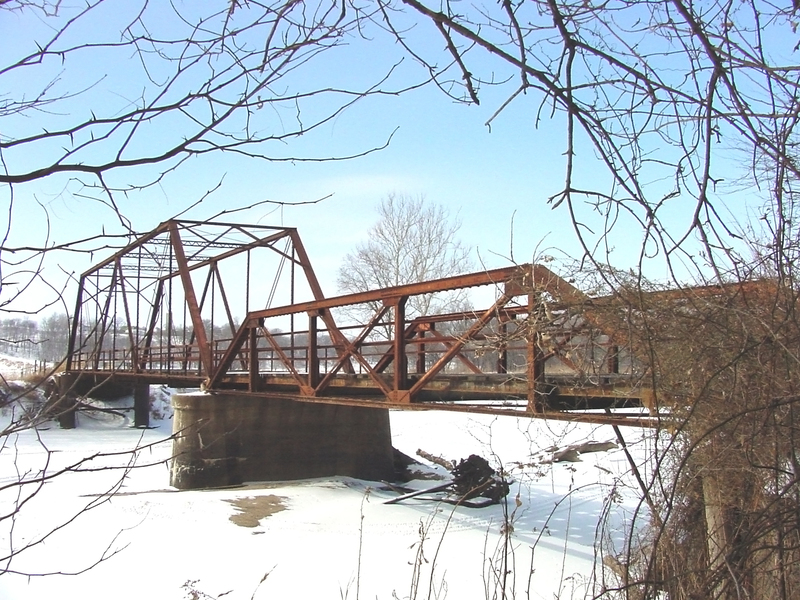 Although they later superseded the Pratt when the state highway commission developed its standard bridge designs in 1913, Warren trusses were rarely built in the 19th century; only a few pin-connected examples of this structural type were ever constructed Iowa. All but a handful of these have subsequently been razed. The Red Bridge is thus technologically significant as an intact example of this exceedingly rare structural type. Although substantially altered by the addition of the pony truss approach span, the bridge is an important and uncommon remnant of early Iowa transportation [adapted from Fraser 1990]. Closed to all traffic with north approach span collapsed. Approach span collapsed in Spring 2013. Future uncertain as bridge is fenced off from over 1/2 mile on each end. December 4, 2016: Updated by Dylan VanAntwerp: Removed category "Skunk River"
October 11, 2012: Updated by Jason Smith: Added categories "pin and riveted connections", "A-frame portal"
The restoration support group's Facebook page hasn't posted about the bridge failing, and a commentor on the flooding picture on the group said its "been through worse", FWIW. My wife, daughter and I tried to visit this bridge during our Iowa/USA visit in August and despite leads that claim that the best way to get to the bridge is through the south end, that end is completely closed off to all traffic and is posted with No Trespassing on there. There is no way to get to the bridge from either end of the crossing. Apparently liability reasons and the lack of forthcoming among the property owners on the south end have prompted authorities to fence off the road leading to the bridge beginning at the farm. Still, according to the organization wanting to save this bridge, it appears that the structure will remain in tact until it's either washed away by floods or a solution can be found to relocate it somewhere else, the latter of which there is no permanent place for it as of this posting. Support the preservation of this great bridge!